10/19/17: Generation Women is now a monthly show at Caveat Theater! Time Out New York think we're part of Your Perfect Weekend. 10/10/17: Some fun interviews up at To Her Door, Bonnell, and Bemis Reviews Books. 8/29/17: Pix of the (awesome!) paperback launch up in the Gallery. 7/22/17: Finally got my hands on the paperback! Come celebrate with me at Books Are Magic on 8/23! It's onsale 8/8. Peep the cover on my Instagram. 6/21/17: Generation Women launches at the Wythe Hotel in Williamsburg, a new female storytelling night hosted by yours truly. 5/28/17: The Regulars is a finalist at the Bisexual Book Awards on Saturday June 10th, in NYC. 3/22/17: The Regulars is included in Booklist's Top 10 Women's Fiction novels of 2016. 3/1/17: I'm interviewed on the Wise Guides podcast. 2/16/17: The Regulars AND my new one The Bucket List are going to be audio books! I just filled out the casting form -- pretty exciting. 2/1/16: I was a performer at Women of Letters, the iconic female storytelling night at Joe's Pub. 11/8/16: My online course just went live! The Pro-active Author is here to help! 11/20/16: Big news! The Regulars is a finalist in the USA Best Book Awards! 12/1/16: The Regulars wins me the badge of Rising Star 2016, thanks to Amazon UK! 9/27/16: My full radio interview with 2SER's Final Draft. 9/26/16: "Smart, saucy and seriously straight talking, The Regulars is a modern day fairy-tale with all the magic of Cinderella and the cringing disasters of Girls." Rock star ★★★★ review in U.K.'s CultureFly. 9/15/16: I love this review in Australia's Yen magazine: "equal parts guilty pleasure, insightful social commentary and hilarious banter." 9/2/16: I'm featured as Cora's Fearless Female! Love these guys. 8/23/16: Look which celeb showed up to the LA launch! 8/22/16: Refinery 29 knows The Regulars makes a damn fine beach read. 8/19/16: The Regulars is top of the list for Red Magazine's must-reads for August! "A smart, sassy, salutary lesson in being careful what you wish for." 8/18/16: Honored to have been able to write about the legendary Clara Bow for Bust Magazine. 8/15/16. "I had no idea that I needed to read women’s fiction featuring a woman who loved other women until I met Evie." Very touched by this lovely review at Chick Lit Central. 8/12/16. Oh vey! People think I'm "charming". 8/11/16: Pub day in the UK! Pip pip! To celebrate, here's what Buffy taught me about feminism for Glamour UK and my top four feminists in fiction for Female First. 8/10/16. I ask if Sweet Valley High screwed me up and Grazia were kind enough to publish it! I tell In-Style how to quit your job and write a novel, and they also included Regs in the Best Books of August. 8/9/16: Do you like crazy narrators? I do, and I told Off the Shelf who my fave 8 were. 8/6/16: I talked to Julia Roy about writing great stories for her podcast How We Work Now. 8/5/16: I wrote an essay about why we need feminist pop culture for I Am That Girl. 8/3/16: So much fun stuff dropping! I wrote an essay for Cosmo about whether I'd take Pretty or note, told Hypable about my four fave magic realist novels and dished on my new hobby to the gang at Shelf Pleasure. 8/2/16: PUB DAY! Celebrating all the things! 8/1/16: Love this cute piece in InStyle about how The Regulars is one of Lea Michele's fave things, and an op-ed for Daily Life about writing fun feminist fiction. 7/23/16: I got so much love for my Medium piece You Don't Need Straight Privilege to be Happy. 7/19/16: Buzzfeed taps The Regulars as a must-read for summer. Curve magazine does a full page feature, which I looooovvee! 7/12/1: Cosmo features The Regulars as one of their August reading picks! 7/1/1: ReadBrightly reckons I'm a fab Grown-up Read for summer. New In Books lists me between Liane Moriariy and Amy Schumer in the Buzziest Books of the Summer. Talk about a luscious lit sandwich. 6/25/16: Elite Daily thinks Geminis should read The Regulars. The Reading Room knows I pair with Fifth Harmony. 6/7/16: "Wine and struggle are best when shared." My monthly writers' salon is written up in Brooklyn Magazine. 6/2/16: Wheee! 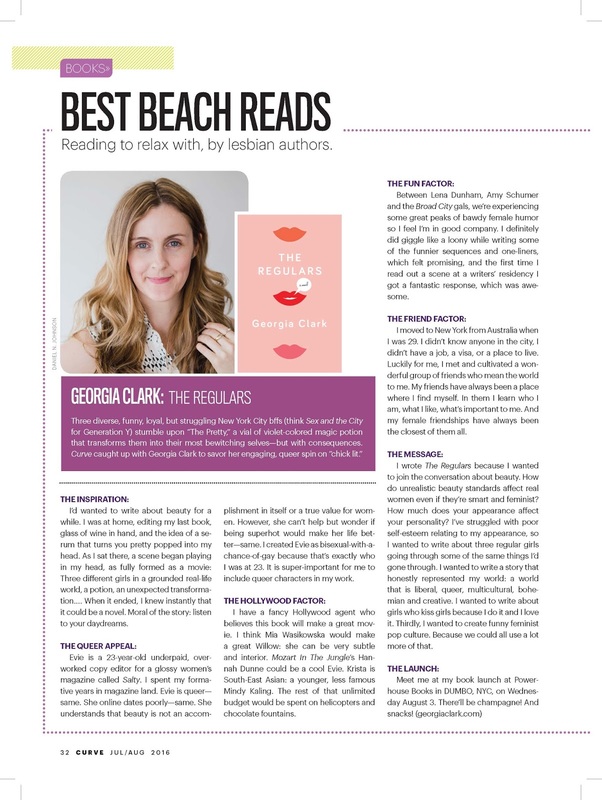 The Regulars is a summer reads pick for Popsugar, Hollywood Life, and Simplemost! It takes a village to raise a book. If you’re here, you’re part of my village. Thank you: I am so damn grateful. The Regulars is the most personally meaningful work of art I’ve ever created. I truly believe this book can be a best-seller—we’ve already had so much amazing praise from smart, cool people, plus we’ve had foreign publishers jump on it: The Regulars is being published in the U.K., Australia, New Zealand, Latin America, Italy, Brazil, Germany and more. But I need your hearts and minds to get this book to as many readers as possible. Whether you have five minutes or five hours, there are a few highly effective ways you can became a part of what is sure to be a crazy wild success—and I so appreciate anything you can do to help. Bonus: Everyone who joins the squad gets a free, customized kiss from me. Facebook, Twitter, Instagram: whatever your jam, get that Regulars cover on ‘em all! How about a snap next to a national monument? They say it takes readers three times seeing a book for it to register as something they should pick up. So saturation is what we’re aiming for. Tag me (@georgialouclark), use the hashtag #TheRegulars, and/or link to your favorite bookseller. 2. Write a review on Amazon, Goodreads or booksellers’ websites. Reviews aren’t just a way for readers to decide whether a book is for them or not. On sites like Goodreads and the all-important Amazon, the number of good reviews bubbles books to the top of readers’ searches. You don’t need to write an essay: just a ‘Loved it, so good’ will work. If you’re stuck, just pick one or two things/characters/moments/ideas that you enjoyed. It only takes a minute and it really does help. Plus I really want to hear what you think about the book (Even though everyone says ‘Don’t read your reviews!’, everyone does). 3. Buy a copy... or 100 copies! Word of mouth sells books. It’s why independent bookstores and booksellers are so important and it’s why authors with big fan bases create best-sellers. If you love being ahead of the curve and sharing recommendations, then loosen those lips and spread the love. I really can’t do it with you, my street team, my angels, my boos. For those in the media (or with friends in the media! ), the answer is yes: my book and I would love to be featured on your online portal /your paper media/channel/podcast/radio show etc. You can contact me directly at hellogeorgia@gmail.com.